Image © Benny Chan / Fotoworks. Based on the emerging science of MetaBiotics, Amare Global develops natural health supplements for mental and physical wellbeing. A young company with a clear mission – empowering people to live happier and healthier lives—Amare engaged IA to design its first headquarters to embody its mission and build its culture and brand. Criteria included an impressive product showroom, flexible space for events, a powerful presence for sales recruitment, and an inspiring and calming environment with a creative space for intensive start-up work. When Amare asked IA to identify an appropriate site, the team suggested INTERSECT, a 15-acre urban campus in Irvine, California, that IA was renovating to focus exclusively on wellness. With a plethora of indoor and outdoor amenities—event lawns, a conference center, outdoor dining with a fire pit and beer garden, walking trails, fitness center, game pavilion, and a like-minded community of potential tenants—the choice was easy. As the single ground floor tenant of the site’s main building, Amare occupies two suites. Their entrances are designed to flow from the building lobby that separates them. Common area finishes gradually move from the lobby into the private spaces. Wood tile and ceiling beams extend through both entrances creating an open look that ties in with the building design. As the elements transition to Amare’s polished stone and open ceiling, branding is integrated. The design team crafted a perfect balance of Amare’s signage and mission statement within the building lobby without overstepping the campus identity. Throughout the design biophilic elements align with Amare’s mission. A product display at the entry, intended as an indoor extension of the exterior garden, features Amare products on custom wood and mirrored pedestals rising from beds of pebbles and succulent plants. Complementary in form, custom light pendants drop from the wood-slat ceiling. The components mimic nature’s stalagmite and stalactite formations. Although leveraging the building’s facilities would meet Amare’s marketing and training needs, and the two suites combined met footage requirements, the challenge was keeping the Amare team cohesive to build a unified culture. To achieve that unity, working business groups are positioned for close proximity in the larger suite; the smaller suite houses the boardroom, kitchen/lounge, and independent IT group. Plentiful natural light, a primary objective, comes through the open work areas; offices are located at interiors. Workstations and meeting areas are positioned against an exterior wall, with a native California garden scape in full view. Sit/stand desks and ergonomic chair options offer staff choices; break-out areas with lounge seating let staff move around and work anywhere. Stocked with healthy snacks, the kitchen/lounge provides the nourishment essential to fuel the hardworking staff. 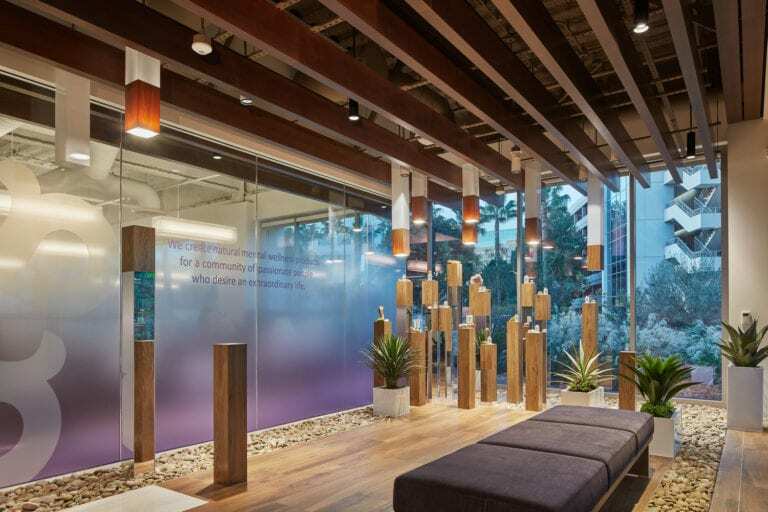 The nature-inspired design supports the campus wellness platform and elevates the lobby experience. The high trafficked lobby increases the Amare brand’s visibility. Learn more about IA's approach to wellness in the workplace. Click below to read "Wellness in 2018: Community and Inclusion Drive Well-Being."